Envirotek Systems provides installation and maintenance for effluent pumps in Missouri for Springfield, Nixa, Ozark, Branson and Kimberling City. 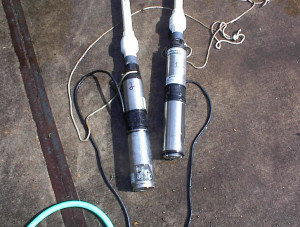 An effluent style of sump pump is designed for only the liquid portion of sewage. They are unable to handle large particles of sewage. Most of them used in residential applications are normally 1 horsepower or less. Some are made to operate in conjunction with a control panel. They have small diameter turbine pumps. We provide effluent pump repair services for all brands and types of controls. Common causes for failures are often due to improper installation or pump selection. Other reasons are due to the fact that manufacturers use only residential duty components. This allows them to perpetuate the sales of more pumps. They can sometimes fail due to restricted filter screens. The screens or filters restrict the water entering the pump or flowing past the motor that drives the it which in turn causes it to overheat, eventually causing component failures. Other causes of maintenance failures for effluent pumps are due to being used in the wrong application. The impeller can become clogged and the rotation can be stopped by solids. Failure in the turbine style effluent sump pumps sometimes occurs because the pump does not have the proper curve for the application. If there is not enough head pressure against the pump it can cause premature failure of the thrust components. At Envirotek Systems we recognized the inherent problems of residential duty sump pumps. That is why we developed the Visi-Pump brand and control system. It uses only long-lasting industrial motors and components. No other manufacturer’s currently offer anything close. If you are having trouble with your effluent pump and controls, rest assured that Envirotek has a solution for you.